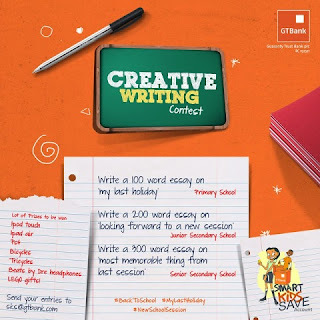 Guaranty Trust Bank, GTBank, announces its Smart Kids Save (SKS) Back to School Competition for Nigerian students and pupils. GTBank's Smart Kids Save account is designed to enable parents/guardians save for their children aged between 0 – 17 years. The SKS “Back to School” creative writing competition is an essay competition sponsored by GTBank for Primary School, Junior Secondary School and Senior Secondary School students in Nigeria. Eligible pupil and student applicants are invited to apply according to the terms and conditions set out below. By participating in this competition, entrants are deemed to accept these terms and conditions. 1). The SKS “Back to School” Competition is free and open to all SKS customers who submit their completed entries on or before the announced deadline. 2). Entrants can only be in one category: Primary School, Junior Secondary School or Senior Secondary School. 3). All entrants require parental or guardian consent to enter the SKS “Back to School” competition. GTBank ("the Organiser") reserves the right to require proof of the relevant consents. 4). An entrant can submit only one entry. Entrants will be judged based on the creativity and originality of their written essays. Entries must be the original work of the entrant and not have been published (as a publication registered with an ISBN, ISSN or Cataloguing-in-Publication entry), broadcast, or won a prize in any previous competition. Primary School - “My Last Holiday” a 100 word essay. Junior Secondary School- “Looking forward to a New Session” a 200 word essay. Senior Secondary School- “Most Memorable thing from last session” a 300 word essay. Submit all entries by email to sks@gtbank.com. It is important to read the Terms and Conditions(pdf), and also visit the official website (link to it is below) for complete information on this essay competition. Submissions for the SKS “Back to school” creative writing competition will begin on Friday 9th September 2016, and will close on Friday 14th October 2016 by 6pm. If your entry is received after this date it will not be submitted to the judges. Guaranty Trust Bank plc also known as GTBank or simply GTB is a Nigerian multinational financial institution, that offers Online/Internet Banking, Retail Banking, Corporate Banking, Investment Banking and Asset Management services, based in Victoria Island, Lagos. All Secondary School Students of all levels can apply and Primary school students too. The Smart Kids Save account is designed to enable parents/guardians save for their children aged between 0 – 17 years, whilst also developing a savings culture in them. Teaching children the value of savings early can help them develop SMART financial habits for life. GTBank's Smart Kids Save account is designed to enable parents/guardians save for their children aged between 0 – 17 years, whilst also developing a savings culture in them. Teaching children the value of savings early can help them develop SMART financial habits for life.